Catalog > Silver Paper Trophy Good Luck Horseshoe Gift Container Last One! Exquisite Paper Trophy created by artist Denise Sharp. 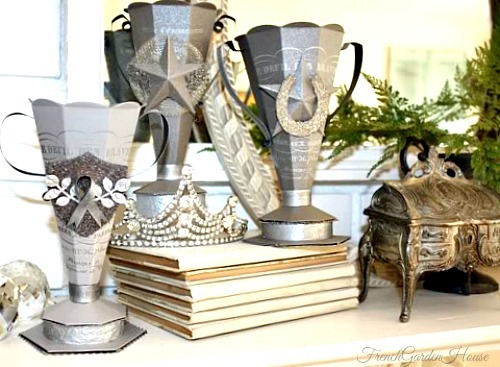 Such a fun way to give a gift card, celebrate Kentucky Derby, display with your other antique trophies. Denise is an accomplished artist, her paper trophies are a playful nod to her collection of tarnished loving cups. 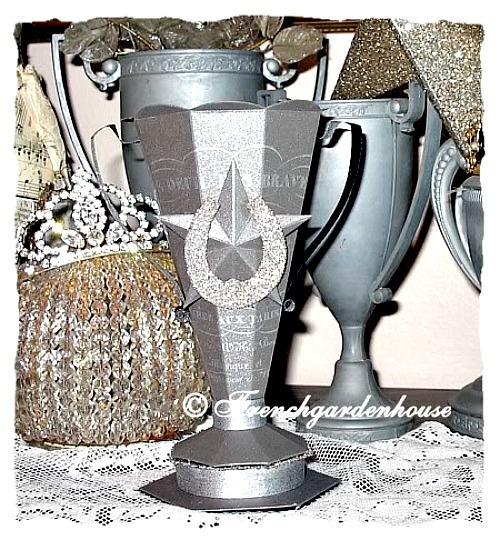 Made of a variety of sterling quality papers, Glass Glitter and other vintage inspired embellishments, this piece measures 7" tall. Every piece is a "one of a kind", individually handcrafted, colors, scripts and other details will vary with each piece. Silver textured paper, a copy of an antique French Document, gilded Star & Glittered Horseshoe for luck make this piece whimsical, as well as beautiful.